Not surprisingly, Argentina, Brazil and Germany had the highest number of tweets during the recent World Cup, but Bosnia, Cameron and Ivory Coast saw the greatest surge in terms of percentage increase in tweets compared to a year earlier. 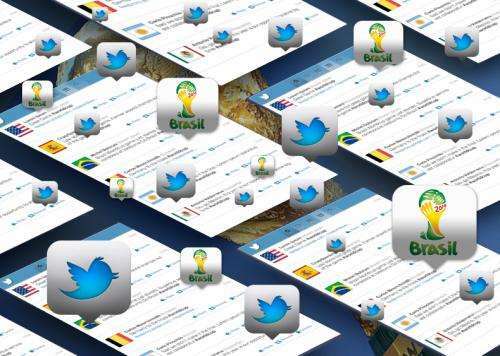 Those are among the findings of researchers at the University of California, Riverside's Bourns College of Engineering who compared tweet volume and sentiment of countries participating in the World Cup during the duration of the event from June 10 to July 15 to the same period in 2013. Argentina had the highest number of tweets with 27.2 million, higher than the host country Brazil (19.5 million) and winner of the tournament Germany (12.5 million). Bosnia (officially called Bosnia-Herzegovina in the World Cup), Cameroon, and Ivory Coast were the top countries in terms of percentage increase in tweets. Bosnia topped the list with an increase of nearly 4,100 percent. The countries with the lowest percentage increase: Ecuador, Australia and Japan, which was the lowest at 158 percent. While one might expect the World Cup would make people happy and positive, only eight countries, led by Algeria and the United States, had a net positive change in terms of the sentiment of tweets during the World Cup compared to the same period in 2013. The countries with the most negative change in sentiment: Bosnia, Croatia and Belgium. The analysis was conducted by Vagelis Hristidis, an associate professor of computer science, and one of his Ph.D. students, Shiwen Cheng. To do the analysis, they used their recently launched social analytics and prediction platform, Social Predictor, which allows users to track Twitter and news traffic using key words. The site also predicts future trends. The analysis was completed shortly after Twitter announced a surge in traffic during the World Cup. Twitter said its users sent more than 672 million tweets during the tournament. That is more than any other event in its history. The analysis conducted by Hristidis and Cheng is available here: bit.ly/1s9IqcU . Argentina attracting more tweets than Brazil, the host country. None of the top countries in terms of percentage increase in tweets (Bosnia, Cameroon and Ivory Coast) advanced to the second round. His home country and rooting interest in the tournament, Greece, ranked low (21st) in terms of increase in the number of tweets, despite advancing to the 2nd round. Hristidis cautioned that the analysis has limitations. For example, it doesn't track alternate names for countries, such as USA for the United States. Thirty-two teams compete in the World Cup, but England was not analyzed because it wasn't among the country names previously indexed by the researchers. They had indexed United Kingdom instead. Also, the analysis is picking up all tweets during the designated time periods that mention the participating countries, not just tweets that pertain to the World Cup. And it does not include tweets mentioning these country names in other languages.